If you want to have a very unique, but small, Hamilton watch collection a good option for you would be to try to find the five Romanesque models from 1960. You could even try to find the handful additional matching ladies versions. But you'll find there is a Romanesque M, N, R, S and T. The ladies got the B, C, D, E F, G and H. Apparently the rest didn't make the cut. Go figure. Anyway, the Romanesque S was only offered for one year. You might think you've seen the Romanesque before. Maybe you did and maybe you didn't. I'd wager you probably saw a Trent. The Trent and Romanesque are very similar, especially in black and white. But in real life they are dramatically different. The Romanesque S came in a 10K yellow gold filled case with a stainless steel back. It was paired with a specially matched Flex-Let bracelet. The sterling silver dial on the Romanesque is a very funky golden color with a linen-like texture that matches the bracelet well. The applied numerals, markers and hands are black. Tucked behind the dial is Hamilton's flagship movement, the 22 jewel 770. This top-of-the-line movement was proudly made in Lancaster PA from 1955 until 1969. I recently was watching a Romanesque on eBay and had every intention of making a go at it but I wound up being distracted when the auction closed and forgot to bid. I know, there are services to help you not miss out like that but I'm old school... I enjoy the thrill of the hunt and prefer to pull my own trigger. Of course that also means I get to enjoy the agony of defeat as well. However, as fate would have it, one of my Hamilton buddies landed it instead. My neglectfulness was his profit - as we didn't end up bidding against each other. So the watch came my way after all. It arrived in great shape. I think it's been worn but probably only for special occasions. Other than being a little dirty, it looks like a "cream puff, only worn by a little old lady to church on Sunday". Watches that have never been worn sometimes concern me... sort of makes you wonder what's wrong with it. But this one started ticking when I gave it a wound. It even has the original sticker on the case back. It also has an original tag on the bracelet. With the front bezel removed, you can see the dial is very unique. I will take extra, super-duper care of this dial as I doubt it could be redone correctly. The movement is bright and shiny, that's a good sign. I don't think a watchmaker has opened this case since the watch originally left Lancaster 55 years ago. The dial-side of the main plate is equally unremarkable. You don't often get to see such a prestine, factory-fresh movement. Everything is cleaned and dried. The hardest part of this overhaul was cleaning the nooks and crannies of the case. The movement is running so it's off to the timer. Hmm... a little fast and a little noisy too. I'll recline the hairspring and see what happens. It took a couple of more attempts but I got the balance to run cleanly. A slight tweak to the regulator slowed the beat rate to an acceptable +6 seconds per day rate. Nothing wrong with this movement. With the dial and hands installed and the case reassembled, I just need to reinstall the Flex-Let bracelet using the original 1960 spring bars. You don't see those too often either. And here's the finished project on it's pillow shot. This is really a very sparkly watch. My camera does not to do it justice. The bracelet is a little short... it would be most comfortable on a person with a 6-3/4" wrist. However, it is expandable if you have the proper links. 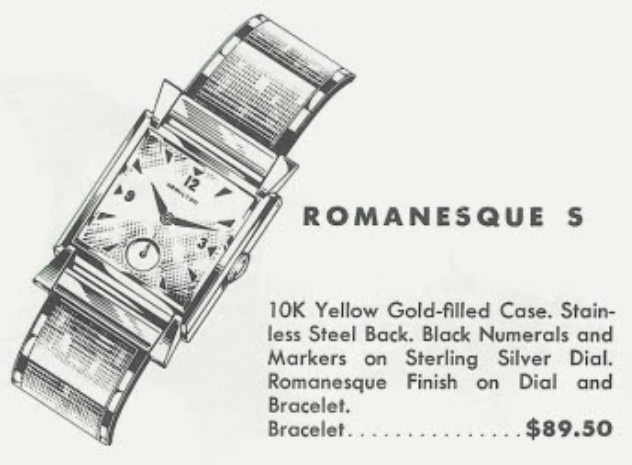 And what would be better to go with an almost new-old-stock watch? How about it's original box. 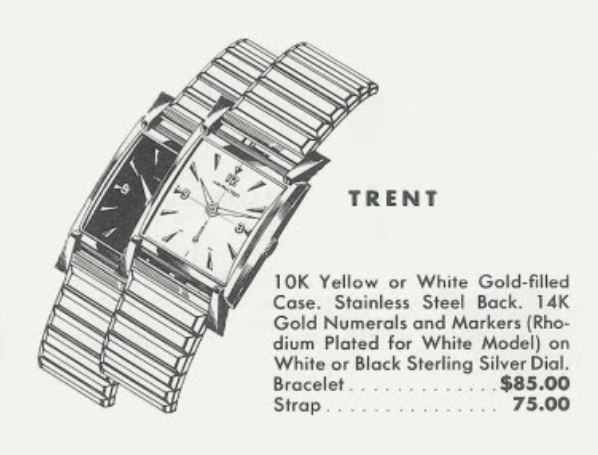 Oddly enough the retail tag on the box is slightly higher than what's shown in the catalog but I don't doubt that this box and watch have been together since the left the jewelry store in 1960. It's the lower spring on the dial side. It's an Incabloc shock spring. Not all vintage movements used Incabloc springs but those that did all used the same one... part number 541170. The upper and lower jewel settings are not the same but the springs are. Dan, you don't happen to know which Incabloc number the spring has? (for example, 173.03) I'm trying to find a european seller. Nope - I'm afraid not. They all look very similar. If you could find a Kurth Freres parts list, it might identify it, as the same spring is used on those.